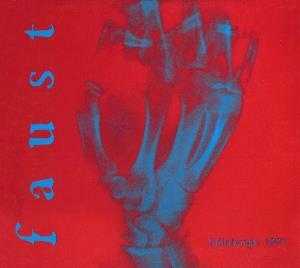 Since their reunion in the early 1990s, there have been two versions of Faust in action; one featuring bassist Jean Herve Peron, and the other keyboard player Hans Joachim Irmler, with drummer Werner 'Zappi' Diemaier playing in both. This album is one of 2 live sets from 1997, both by the Irmler version of the band with essentially the same line up that would subsequently record Ravvivando - guitarist Steve Wray Lobdell also played in the Peron version of the band resposible for Rien. The reviewer who was present at the gig summed the music up nicely; drums and percussion are well to the fore, with the grinding industrial rhythms that would characterise Ravvivando very much in evidence. There are some lighter touches along the way, with nods to the band's roots in the early days of krautrock and some almost psychedelic passages in between the piledriver rhythmic assaults and squalls of electronic noise. There are also occasional vocal interjections that recall some of Christian Vander's more blood curdling utterances in Kobaian, but this is principally an instrumental album. There's a sense of space that is sometimes missing from Ravvivando's densely packed grooves, but the band never relax into self indulgent jamming - they're tightly focussed and at the top of their game. Recently made available as a downloadable album on emusic, this is a worthy addition to your collection if you're into Krautrock, and fans of post rock experimentalism may find it intriguing as well. What you don't get is the visual impact of the band on stage, and of course the innovative studio wizardry that Faust elevated into a fine art is absent, but this album is ample proof of how powerful Faust can be in concert. The sound quality is good but not exceptional. Well worth checking out.